In the hospitals and medical sector, cleanliness cannot be ignored. Significant time and money are invested into hygiene in the medical industry. Almost every premises in the country and beyond has at least one acoustical ceiling, and Penn Jersey’s position as an exclusive Ceiling Pro practitioner means we can return unclean acoustical ceilings to their best. Ceiling Pro doesn’t only work with acoustical ceiling tiles, but it will return them to like-new condition. All commercial and industrial premises should have a focus on cleanliness, and while many may invest in floor and carpet cleaning, they forget altogether about ceilings. You can see from our Before and After Shots Page that we deliver only the highest quality results and hygienic and clean ceilings for all our customers. It is much more commonplace for a business to replace its ceiling or tiles, or simply paint over them, than to consider cleaning. Avoid the unnecessary cost and hassle of either of these processes with our commercial and industrial ceiling cleaning service. Cheaper than replacement and painting, our cleaning process not only removes any dirt and grime, it sanitizes to nasty odors are gone and can even improve the acoustical and fire-retardant qualities of your ceiling. Penn Jersey is proud to be a CeilingPro practitioner, utilizing the high quality and unique ceiling cleaning process offered by CeilingPro in all our cleaning services. The process is especially designed for textured and acoustical tiled ceilings, which are a common choice for many hospital and industrial environments. This type of tile has many benefits from sound absorption to great value, but this is only the case if they are kept fully clean and maintained. Cost effective, long-lasting results: painting over the tiles just masks the problem and replacing the whole ceiling is a great expense. Our cleaning process avoids both these problems. Lighter, brighter spaces: the luminosity of your space is enhanced with properly cleaned tiles. Take away the energy consumption that comes with investing in additional lighting. Maintain the integrity of your tiles: textured tiles have specific properties which make them a great choice for your premises. Cleaning your tiles ensures they maintain their acoustical and sound absorption properties. It also ensures their fire resistance is maintained. This isn’t the case if they are painted over. Hygiene: hygiene is key concern for all business people but especially those in healthcare and hospitals. Our cleaning process ensures full sanitization, disinfection and deodorization for a safer, more hygienic environment. Working with only professional crews, you can expect a quick and mess-free one coat service. Our non-toxic cleaning process takes very little time, covers all services, cleans your fixtures including dirty grates and vents and is possible without any business interruption. 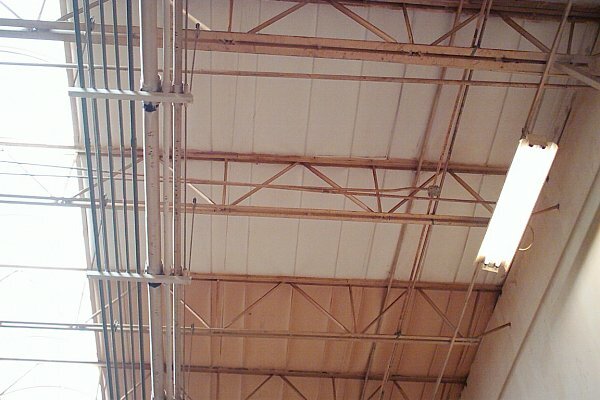 Whether a small factory, large superstore or medical business, Penn Jersey can help bring your ceilings back to like-new quality. In the hospitals and medical sector, cleanliness cannot be ignored. Significant time and money are invested into hygiene in the medical industry. You may pay regular cleaners on a daily basis to keep your floors, walls, and equipment clean, but the same is not usually the case of ceilings. Best practice in any high-risk environment such as a hospital or medical facility is to exercise the highest level of hygiene and cleanliness possible. With Ceiling Pro and Penn Jersey, you can ensure your ceilings are quickly and easily cleaned and sanitized. It is sometimes hard to see just how much dirt and grime has built up on your ceiling. It’s a much less obvious problem than the floors or the walls but it needs just as much attention. The same bacteria and harmful health hazards can grow in ceiling as in any other part of your premises so quality cleaning is necessary to provide healthy premises. This is particularly important in hospitals and other businesses in the healthcare sector, where the spread of germs and bacteria can be particularly hazardous and be genuine risk to health. At Penn Jersey we are happy to work with any business requiring our commercial ceiling cleaning. It’s a quick and easy process which has many benefits for your business. As well as feeling and looking better, you may benefit from improved lighting and a great cost saving. Rather than considering a whole ceiling replacement or painting over your tiles and reducing their efficiency, opt for commercial ceiling cleaning. We are more than happy to talk through your options and show you examples of just how effective our cleaning processes can be. Contact us today to discuss your requirements.